“Cowboy Guilt” from TORRES (@torreslovesyou) shows how the contrast principle is alive and well, after all these years. Looking for good songwriting content for your iPad, Kindle, laptop, desktop, or other PDF-reading device? Gary Ewer’s eBook Bundle, “The Essential Secrets of Songwriting”, will show you why good songs are good, and how to apply those lessons to your own music. Get the complete bundle of 6 eBooks (plus 1 free eBook) for $37. Read more.. The verse and the chorus sections form the bulk of most pop songs. Beyond those two sections, songwriters can and will add in optional sections such as pre-chorus before the chorus, and then a bridge, bridge-solo, bridge-instrumental, or some other such section to follow the second chorus, before the eventual return of that chorus. Most of those ideas actually have their roots in Classical music design. 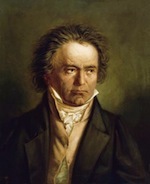 With a Mozart or Beethoven symphony, for example, there are two main themes (melodies). Beyond using those two melodies, classical composers usually add in a transitional melody that takes the music from the first theme to the second one. They also include a lengthy development section, not unlike a pop song’s bridge section, that follows the second theme, before the original first and second themes return to be heard again. For most Classical composers, then, the job was/is to create two melodies that would serve as a first and second theme. Once they have those two main melodies, they have enough material to create an entire first movement to their symphony, since any new ideas in the movement would usually evolve from those two original melodies. The 1st melody is generally loud; the 2nd movement is generally soft. The 1st melody is aggressive in character; the 2nd melody is gentle. The 1st melody is comprised of short, 4-note “cells” that have a downward shape, even as the cell moves higher. The 2nd melody is comprised of longer 8-note cells that have a general upward direction, only turning lower as it ends. Not every first melody/2nd melody comparison of every Classical symphony will display all these traits, of course, but the point is that the composers make a conscious effort to compose their two melodies sound different — to provide musical contrast. The verse melody is comprised mainly of melodic leaps in a downward direction. The chorus melody is comprised mainly of melodic steps in an upward direction. The verse melody uses a dotted-quarter note/eighth note rhythm. The chorus melody contrasts with a mainly quarter note rhythm. In addition to those two traits, you’ll also observe that the instrumental intro offers upward leaps, contrasting immediately with the downward leaps of the verse melody. Nonetheless, the best songs out there give listeners, even on a subconscious level, contrasting musical ideas that heighten musical interest and keep them coming back for more. The contrast principle, in the way that’s been described in this post, has been around for centuries. And if you take a close look at the melodies of the best songs from the pop era (1955-present), you’ll still see its importance hasn’t really waned at all. Contrasting musical elements is the best way to keep an audience intrigued — and humming your tunes. Posted in Melody, Song Form and tagged Beethoven, chorus, formal design, Mackenzie Scott, Melody, pop music, song form, songwriting, TORRES, verse.